* We do not charge service fee. * Rates indicated may change without notice. * Check-in after 14:00 and check-out until 12:00. Confirmation of the reservation will be made by means of an advance deposit of 50% of the total value of the package. The balance must be paid at check-in. We accept all major credit cards. A perfect romantic evening. 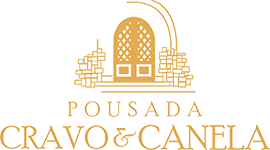 Based on this concept, Pousada Cravo & Canela prepares their suites to receive such special guests. We take care of the details to make your trip unforgettable, rose petals on the bed, half-light bedroom, delicious champagne with strawberries, lighted candles and a romantic show on the LCD TV channel, complete the mood and make the couple forget from day to day and make the most of this moment. On the first night. Reading a good book, relaxing in the thermal pool or in the sauna, is a good program while the couple waits for their massage schedule. Massage is a structured touch that has been practiced in all cultures for centuries. It stimulates and encourages the body to perform its normal functions. The therapeutic effects of massage include relaxation of the tense muscles and stimulation of the circulatory and lymphatic system. On the second night. Enjoying the romantic atmosphere of Pousada Cravo & Canela, in several charming surroundings, such as garden, gazebo, american bar, fireplace room, and the beautiful clock room, which retains the original decor of the former residence. governor of the state of RS, the couple participates in a photo shoot, receiving a cd with 15 photos in high definition, ideal for quality printing. On the third daily. On the third daily. In the Restaurant Belle Du Valais: Conceived and awarded by the 4 Wheeler Guide as the Cravo & Canela Inn, the Belle Du Valais Restaurant was voted the Best Swiss Cuisine in Brazil, distinguished by its charming and romantic atmosphere, and also by the unmistakable flavor of its dishes, (menu with couvert, main course - La Pierrade (filet mignon and grilled chicken fillet on volcanic stone, served with special sauces and potato swiss), chocolate fondue for dessert, and 2 waters or 2 soft drinks). On the fourth daily. Light camera action! Visiting Canela & Gramado and not watching a movie in the festival palace is considered a heresy by the gods of the 7th art, because in this place, annually, there is the Gramado International Film Festival, the most important Brazilian cinematographic event, feel like the indicated to receive the Kikito, watch the film in poster and know the photographic collection that highlights the icons of the national cinema over the years. On the daily fifth. In the charming American Bar, the couple enjoys a unique moment, plate of cold accompanied by red wine (cabernet sauvignon), we set the stage for you to eternize this moment. On the sixth day. Delicious fruit fondue with typical Gramado chocolate. In the seventh daily. Forma de Pagamento: A confirmação da reserva se dará mediante depósito bancário antecipado de 50% do valor total da reserva, ou se preferir, 100% do valor total da reserva parcelado em até 6 vezes em cartão de credito com parcela mínima no valor de R$ 350,00. O saldo da reserva e extras deverão ser pagos no check-out. Aceitamos todos os cartões de crédito.